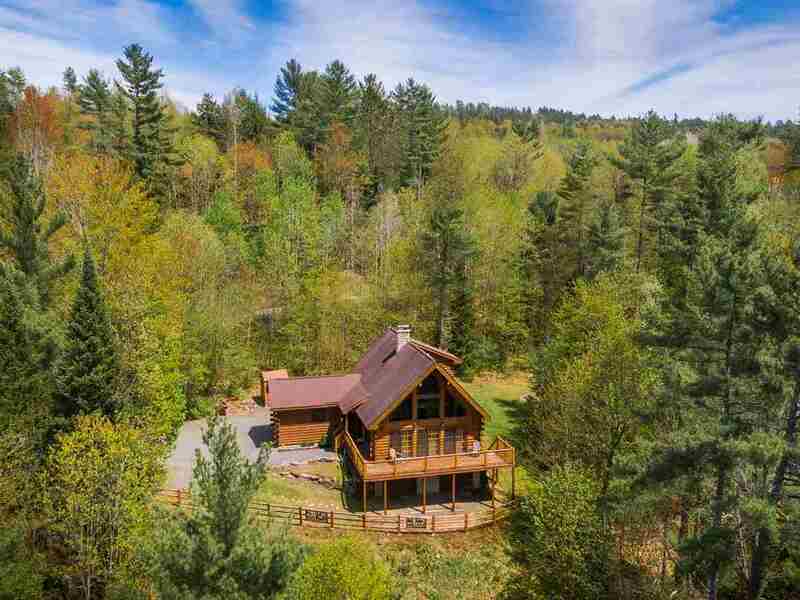 This absolutely well maintained and gorgeous, three-bedroom, two bath log home sits on over six acres of land; plus offers frontage on the Wild Ammonoosuc River, which you can hear when you are out in the yard, or sitting on the large deck. Coming through the front door, you walk into the open concept and vaulted living and dining room area, plus the stylish kitchen with its own wine cooler! There are tiled and hardwood floors throughout, and lots of light coming in from the sliders in the dining and living room that go out to the deck. The second level offers a cozy sitting area that overlooks the main level, and from the A-Frame there are large windows that look out to the delightful wooded meadow area. There is also a large master bedroom with its own three-quarter bath. The large full basement has a laundry and workshop area, and plenty of storage area, and you are able to walkout to a nice covered patio area. You will love being right in the heart of the many 4-season activities that are offered in the White Mountain Area. Plus having a private location yet very accessible to the hospital, shopping, hunting, fishing, camping, kayaking, skiing, and with over 450 feet of deeded access to the Wild Ammonoosuc River for swimming, fishing, and gold panning, what more can you ask for? By the way, only 10 minutes away from the White Mountain National Forest. Access to snowmobile/ATV trails from the property!